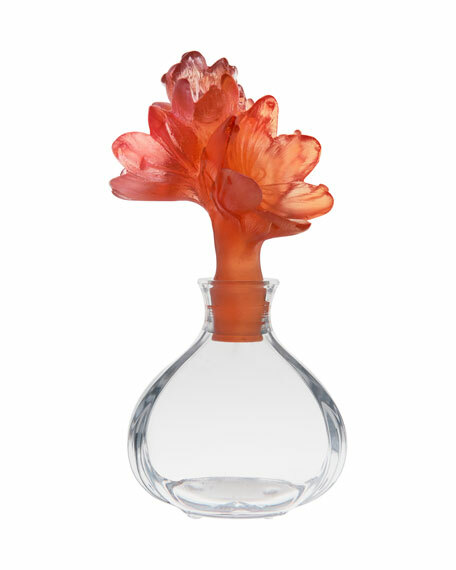 Lead crystal perfume bottle with flower top. Handcrafted; may vary from image. Derived from the crocus sativus, the saffron flower is considered as one of the most valued flowers in the world for its singular pistils that make precious spices. Cultivated since the fifth century BC in the Middle East, the saffron was renowned for its therapeutic qualities and was seen in abundance at the table of Achaemenid rulers. Today, it sublimates the finest dishes, tints the noblest ornaments, and adds light to the most sophisticated cosmetics. An ode to a demanding and delicate nature, the Safran collection narrates the story of the blossoming of the flower in the sandy and sunny lands, and the harvesting of the pistils so fragile but yet so precious. Like the yellow-gold spice that colours the dishes, the Safran pieces are rich in warm colors, evolving from amber to red. This collection, sublimated by the remarkable "pate de cristal" of the Maison, accentuates the meticulous work of the talented craftsmen of Daum.